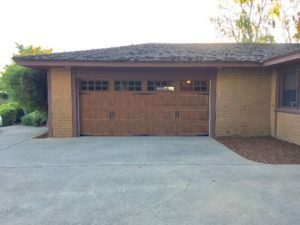 BEFORE AND AFTER: Tilted Garage Door to Carriage Garage Door Transformation. Our client, Neal, contacted us via Yelp wanting to make some updates to the exterior of his house. A great way to add interest and update your exterior is to change out your garage doors. 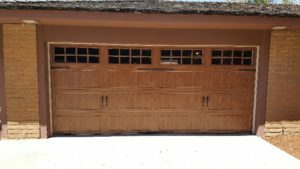 Carriage Garage Doors are a great choice. 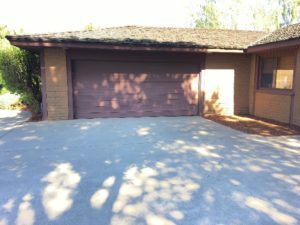 They instantly upgrade your garage and home buyers love the look and feel they provide. Wood versus Steel Carriage Garage Doors Neal had done his research and was debating between wooden carriage doors or a carriage looking steel garage door. More often than not, any style steel garage door is the better choice. Steel is more durable than wood, for one. If you like the look of wood, there are doors that have the look of wood, but are made from steel, which is the best of both worlds. Steel doors also offer lower maintenance as compared to wood. Steel is also much cheaper than wood. Seems like a no-brainer, right? In the end, Neal decided on the Clopay Gallery Ultra Grain Insulated Door with a dark oak finish and a square grill window design. He also wanted the “two door look”, so we ordered 8 spade strap hinges and 4 spade lift handles to complete the look he wanted. We might be biased, but the result is nothing short of amazing! 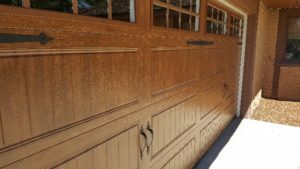 In addition to these beautiful new carriage doors, Neal also wanted a strong garage door opener that was also as quiet as possible. We ultimately installed a Lift-Master 3240 Screw Drive opener. We think it’s the best on the market for what Neal was looking for. I’m incredibly pleased with the door! It looks fantastic and you guys did a great job. Now I got the best looking garage door in my neighborhood!